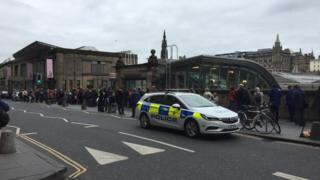 Waverley Station in Edinburgh was evacuated after a fire broke out in an air conditioning unit. Scottish Fire and Rescue said it sent four crews to the railway station at about 10:50 after reports of smoke coming from a vent. A fire alarm was also activated. ScotRail has warned of services being disrupted. Police Scotland later tweeted that the incident was "not suspicious" and the station had reopened.